The place where we are presently living cannot be characterized as urban or rural; it is somewhere between the two and could be called semi-rural and urban. Ah, sometimes these labels limit us from categorizing. Well, I hope you agree that everything cannot be slotted into labels. I am digressing from my topic, so let me get back into the groove. Sometimes when sleep plays truant, I lay awake and wonder. It is at those times, that my eyes are fixed to the tiny sparks of light that flit across my room. The dark room gains a glow from these tiny fire flies which have somehow wandered into my room through the open window. Sometimes, I see the light through the mirror and I must tell you that the reflection of the fire fly’s light in the mirror makes a lovely sight. You should know that fire flies don’t dwell in urban spaces. They are found only in the country side as there are not many lights there. Perhaps the presence of many lights in the urban and semi-urban places has rendered our eyes blind to the luminous fire flies. The weaver-bird (Ploceus philippinus) which weaves its nest beautifully supposedly catches these fire flies to light its nest. 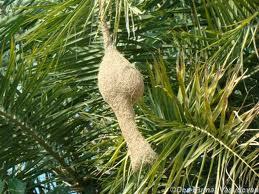 Many villages have an abundance of these nests hanging from trees and sway gracefully in the direction of the breeze. One could spend a lifetime looking at those nests swaying back and forth. I am yet to see a nest in the dark. I am waiting to see that spectacle. These flies spread light and warmth, niggling my senses and thoughts when I find that sleep has betrayed me. Looking at those stars that twinkle in my room, I slowly fall asleep and dream of weaver birds and their glowing nests. Have you seen fire flies/ weaver bird’s nests? Does your living space bring you joy? Hi Susan .. I love fireflies .. they are just magical to watch .. and in fact weaver birds just amaze me - such dedication to nest building .. each animal has its own special ways .. we are so lucky to be able to appreciate our nature ..
During my childhood days there were more fire flies to see but now once in awhile one or two get into the house and they are beautiful. As for weaver birds as we drive the country side here we an see their nests hanging on tree but I am yet to see one glowing in the night. What a beautiful sight that would be. I've never seen fireflies, Susan, and this post makes me envy you so. I have seen weaverbird nests, though, back in my mother's village in Goa. Aren't they clever creatures? They weave a nest for themselves and bring home fireflies to light them up. how sweet..initially when I read the title of your post,I had something else in mind Susan(and I think u know what)....way back as kids,we had a lot of fireflies,at the place I grew up in,we used to capture them and keep them in a handkerchief,switch off thee lights,it used to be fun..
Alas not seen here in the uK. Which is a shame, would be hysterical seeing my 2 daughters running for their lives being followed by a shinning light. Alas the insect world is not going to get either of their love in a hurry. I blame their mum. Susan D, I live on the edge as well--suburban-rural edge, that is--grin! Fireflies galore, but even more, back on the farm, when I a child. Mosquitoes now inhabit all of SW Florida. We have wonderful mosquito control, but may it kills fireflies also. I will look into that, and let you know! Thank for the inspiration. Peace and JOY, as you spot reflections in the mirror, which sometimes are brighter than the original. Fireflies are one of the few innocent and sweet memories I have of childhood. Thank you so much for taking me there and reminding me. No I don't see fire flies. Maybe they don't come to the desert. But yes, my living space brings me tremendous joy. I thank God daily that I am so fortunate to live so near my mountains, so close to nature. Have a great weekend Susan. Enjoy the little lights. 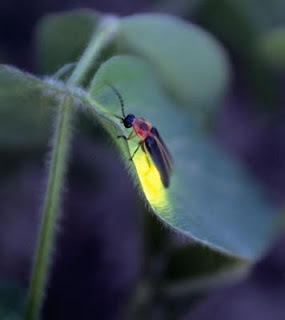 I have never seen a firefly in the dark night. Weaver bird using them to lit their nest must be a damn spectacular sight ....... these are perhaps typical for tropical region. I felt reading a poem, thanks Susan. 'when sleep plays truant.....' ahh! Wow!.Absolutely fabulous.Well writter Susan.Like ur post :Luv ur blogspot. they have a calming effect on me as well. Lovely post, Susan! I think living in a place which is semi - semi rural, semi urban - has its advantages. You get to enjoy both worlds. Never seen fireflies or weaverbirds. My loss. Judging by your lovely description, fireflies look like magic. It is really fascinating to watch these small insects and their habits. I used to follow these fire flies and try to catch them in a bottle when I was a kid. Like that picture of the firefly. Colleen, you sure have a way of warming my senses with your comments. A heartfelt thanks for these lovely words. Moments as those described in the post are quite treasured. Absolutely. We are indeed lucky to experience these manifestations of nature. Glad that this post brought back childhood memories for you. I'm glad that you fall asleep gazing into the eyes of your life's love. All the best to a lovely life, Zuzana. You will soon see them, dear Karishma. You are always welcome to run upto my place -- the doors are always open, you see. The song that you sent me over FB is a lovely accompaniement to this post. I wish I had known that song earlier, Alpana. Won't they die when you capture them in a handkerchief? Mosquitoes are quite annoying. I detest them. But sad to know that firelies get killed in the Mosquitoe control programme. Glad to know that your childhood was brought back through this post, dear Jan.
Joy is all you need. Glad to hear that, Myrna. I love the mountains: serene, calm, resilient and strong. What a lovely compliment. Thanks and am at the top of the world, you know. Smiles and hugs to you. Welcome here and so glad to have you stop by. Thanks for your very kind words. Your comment inspires me to write more and well. Ah, I go hope and wish that you get to see these magical aspects of nature. You will, I'm sure. We all act grown up most of the time. LaBels limit me but save time!